This is an excellent “catch-up” cleaner that will perform best when used regularly. Butyl based degreaser concentrate that is an excellent "catch up" cleaner that performs best when used regularly. This restorative cleaner promotes bond resilience and durability in the finish while extending the life of the floor itself. Its no-rinse, neutral formulation makes it ultra-simple to use. Special blend of ingredients to break down embedded soils and lift them into solution. 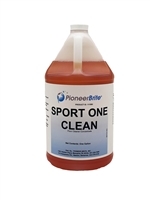 Pioneer Brite STOP IT is a broad spectrum organic odor neutralizer concentrate. Water soluble and formulated with Oxychlorodene for complete odor neutralization. Pioneer Brite Q-10 is designed for use in hospitals, nursing homes, hotels, schools, homes, food processing plants, food service establishments, restaurants, and bars where disinfection, sanitization and deodorization is of prime importance. FRESHEN UP is a concentrated odor neutralizer that is compatible with any cleaner/disinfectant, as well as water based floor strippers, and any carpet care cleaner system. An outstanding floor surface sealer designed for concrete, terra cotta, brick, quarry tile, pavers, stone and many other hard surfaces. Provides superior resistance to abrasion, moisture, soils and staining. Outstanding durability; coating will not whiten or "peel off" surfaces. Highly-concentrated that can be used as a floating lift station degreaser. Biodegradable, so it will not interfere with the biological digestion of existing bacteria. 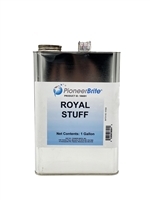 Royal Stuff is a water emulsifiable liquid that can be used to pre-spray carpet stains, ink, gum, grease, etc, then agitate and follow with normal extraction using Pioneer Brite Carpex. Royal Stuff removes tire marks and burns, printer’s ink, decals, adhesives, soap scum. cleans motors, trucks and more. Heavy duty alkaline base used as a component to our Dual Draw system, a powerful, high performance industrial degreaser system that is fast, simple, cost effective, and safe. Patented and solvent free. USDA Rating A-1. The Pioneer Brite axial fan is the ultimate axial fan – packed with features such as a variable speed control, 3 hour timer, 360-degree rotation rack/stand, and built in daisy chainable power outlets to get a variety of jobs done. A specially designed sealed motor prevents damage from water and other contaminants. Good things come in small packages. The Pioneer Brite Heated Carpet Extractor contains a 5-gallon capacity solution tank (approx.). But don’t be fooled by its size. Built smaller for your convenience, the HP60 has the same amount of cleaning power and detailing ability as its large sibling, the HP120. Oh, and automotive detailers, did we mention it runs on only one power cord? Designed for the busy professional, the extractor is powerful, heated, efficient, user-friendly, and durable. Here, all in one place, is the answer to your automotive detailing needs — the versatile Prep Center™ Automotive Detailer. UHS Burnisher produces a superior wet look shine fast all hard floor surfaces. This high-powered burnisher increases productivity, lowers maintenance and labor costs, and creates a safe, slip-resistant floor.Since this unit is fueled by propane, you never have to stop in the middle of a job to search for an outlet. You can keep right on working even on the biggest jobs! One of the most sought after strippers in the market, the Pioneer Brite Sidewinder is a workhorse that will strip your floors clean of finishes and grime and prepare them for restoration. At a productivity of 25,000 sq ft/hr the Pioneer Brite Sidewinder will quickly get the job done. Fast stripping and deep scrubbing is what the Sidewinder is known for - this low hour, low use machine is a steal!